I don't think many hen nights turn into a knitting retreat, but it's the logical solution when every participant is a knitter. One of my best friends is getting married later this year and we all met up in Yorkshire for a weekend of knitting and relaxation. I had been to Yorkshire before for work, but I had never had a chance to spend time in a stunning landscape filled with textile heritage. We took the train from Carlisle to Settle - to our great surprise (and delight) the train journey turned out to be spectacular. It runs past the Pennines and through the Yorkshire Dales. Every station was a Victorian delight with ornate architecture and beautiful details. I can only recommend taking the train journey - it is absolutely stunning and I feel fortunate to have experienced it. And there are sheep everywhere. I was particularly interested in seeing the varieties of sheep in the fields we passed. The Swaledale sheep is the official 'face' of the Yorkshire dales and I spotted a few on my train journey. I am not Deb Robson, so I could not identify all the little dots scampering around the fells but it was still great seeing so many varieties. We had rented a house a few miles outside Settle. It was pretty much my dream house: Georgian proportions, a country kitchen (though I found cooking on an AGA fairly intimidating), a small conservatory with built-in book shelves and open fires in each of the living rooms. Did I mention the views? This was the view from my bedroom (where I sat in the window seat as I took this picture). It looked like merino sheep in the cow-parsley/buttercup field. They fled as soon as I tried getting closer for a better view. Roses in the front garden and a beautiful back garden with views across the dale. It was a bit too cold for me to sit outside and knit, but I was tempted! Once inside, the house offered many temptations..
.. but I stuck to my knitting mostly. I currently have three projects on the go - one that requires a lot of maths, one that requires a lot of concentration and, er, one that's 1 ply lace. I mainly worked on the latter as it seemed more straightforward given the high level of hilarity. I did not move from my comfy chair most of the weekend, though I discovered just how bad I am at playing pool. The adjacent house had a ruby spaniel that loved cuddles, so time was spent doing that too. And copious amounts of tea, tea and tea. Cake was had from the interestingly-named local pub/bakery. It was a lovely weekend. We took the train back to Carlisle yesterday. And then a rail-replacement bus back to Glasgow (when I fell asleep - all that fresh country air!). I'm having the day off today as I'm oddly exhausted after my relaxing weekend away. While it was fun waltzing around a 19th country house for a few days, it's rather lovely to be home in my humble abode again. I'm down to London next week - when I pass Carlisle on my way down, I'll think fondly of this trip. I'm supposed to be enjoying a long bank holiday weekend, so this blog post will be short and sweet. All photos by Mr D. who has lately begun taking more abstract photos and I'm enjoying looking at the world through his eyes. First, thank you to everybody who made the trek to the Fluph yarn shop in Dundee this past Saturday for Yarn Shop Day. I lost track of quite how many people dropped by but I loved saying hello to all (including the dogs that people so thoughtfully brought along). I also loved seeing all the knitwear on display - from a stunning Aidez cardigan to the most exquisite cobweb Shetland "wedding ring" shawl. Later this month I am heading to Yorkshire for another knitting retreat (I'm combining it with seeing far-flung friends). However, I've had yet another jury citation - this is the third since November - so my retreat plans may be cut short. I love spending time in Yorkshire, I very rarely get to see these friends and the retreat location includes a short stroll to a delightful yarn shop, so fingers crossed everything works out. I know many of you wonder about knitting retreats - while you obviously have the option of arranging one for yourself, there are a few lovely 'open' retreats. 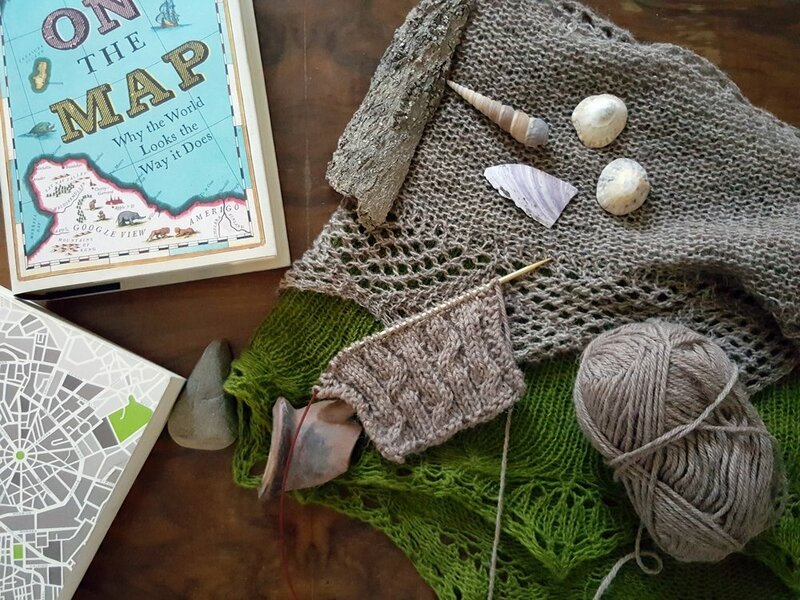 Helen Lockhart of Ripples Crafts has been running a regular knitting retreat on Tanera Mor, an beautiful island off the Scottish North-West coast, and I know she is planning more retreats in the Scottish Highlands. You could also opt to spend time in the beautiful Welsh countryside together with Brenda Dayne (of Cast On podcast fame) and Felicity Ford at the Gwlana retreat. I am sure there are other retreats scattered around the British isles - do share your info in the comments section if you know of any! Finally, thank you for all your kind words about the passing of my art teacher. It was a hard post to write. I am really enjoying all the Byatts popping up both on Ravelry and at the events I attend. While my own group's KAL officially ended at the end of March, several other KALs have strung up. It's such a marvellous thing to see all the colour combinations and personal touches out there. As I enjoy looking through all the project photos, I thought I'd share a couple of the finished Byatts with you. First up is JessieMcKitrick who chose to combine a rich red-purple with a stunning gold colour. This warm colour combination is rich and sumptuous - and it reminds me quite a bit of the Game of Thrones series wherein crimson and gold are the colours of the royal house of Lannister. Hey, I happen to live with someone who has read all the books.. Continuing on with the gold theme, I gasped when I first saw the colour combination that CountrySinger had chosen for her version. I have mild synaesthesia and those two colours vibrate when I look at the photos. I especially love how it's miles outside my own comfortzone and yet I'd wear it in a heartbeat. Now that is colour appreciation for you! Whitehart, aka Sadie, chose to stash-dive for her Byatt. I chose this photo because I think the blue-turquoise looks so stunning on Sadie and works incredibly well with her skin tone. I know many people have been focused on getting the contrast colour right, but here Sadie shows why it's even more important to get the main colour right. This colour combination suits her so well. I have seen the next Byatt in person and it looks so delicate. EllaSkye ran into the problem of not having enough yardage to complete the pattern as written. Her solution was to add a third colour that was a slightly darker shade of her original main colour and she opted to do the cast-off in the darker colour too so the shawl had a strong sense of continuity. It looks amazing and even prettier when you get to see it and squish it in person, I can tell you that. Another Byatt I have seen in person: Helen of RipplesCraft. Helen chose a very contemporary colour combination of a neutral slate gray (she calls it 'peat' - who am I to debate colour with a dyer?!) and a zingy lime green. I love how this makes the stripe section sing. Finally, Noirem's Byatt. I will confess that this photo stopped me in the tracks. A beautiful combination of subtle blue-teal with a silvery contrast colour and then the stunning shawl pin that echoes the cast-off edge. I knitted my original Byatt in a warm teal with a bronze-like edging. Jennifer has somehow made a cool, elegant twin version of that shawl. A lot of other Byatts out there - I've seen gradient versions, glittery versions, and variegated versions. I have somehow managed to design a shawl that lends itself to a lot of experimentation with yarns and I'm really proud of that. Keep uploading those photos. I adore seeing every single one. PS. I cannot resist linking to this thoughtful post about knitting Byatt. It really stopped me in my tracks. To my great delight and surprise, my partner whisked me away on a trip to the Isle of Arran this weekend. The Isle of Arran is about two hours away from Glasgow by train and ferry, but I had never been. I twigged I had arrived among kindred spirits when we noticed small sheep statues along the coast. The easiest way to get around Arran is by bus - we asked to get dropped off at Sannox about 8 miles north of the ferry terminal. Sannox stems from the Viking place name "Sand Vik" (Sandy Bay) - always a pleasure to see places my Viking ancestors have been! We headed towards Glen Sannox - the walkers' guide labelled this "an easy ramble with stunning scenery". The first part of the path was easy (and we stopped to eat brambles - Arran clearly has a micro-climate quite unlike the mainland). The path into Glen Sannox became less friendly (and more boggy) after we crossed the stream. We walked towards Coire na Ciche (The Devil's Punchbowl) with the slopes of Goatfell on our left and the peaks of Cir Mhor and Caisteal Abhail in front of us. I was worried about how my injured left knee would hold up (especially as the path was not as gentle as we had imagined) - but although I was in pain, I did not have to resort to the heavy-duty pain killers and my knee only caused me to stumble occasionally. We couldn't resist a selfie (though I look odd!). I wore my trusty Snorri jumper and i have a bit of a story to tell about the hat I'm wearing - but that's for another day. No filter! When the sun came out, the colours were breathtaking. The clouds rolling over Cir Mhor (the peak in perpetual cloud) kept getting darker, though, and the already brisky wind got stronger. It was a beautiful, rich landscape. Wildlife was all around us too - we saw so many red deer that we got jaded (though I am sure they were not "wild" animals, just "managed"), various birds, the ever-present sheep and I even caught the eye of a little adder. But it was clear that we needed to head back before the clouds caught up with us. It was just after midday, but it felt later. We retraced our steps, had the last of our packed lunch and then caught the bus (the bus - there are no other busses on Arran) making an almost full-circle of the island before going home. What a lovely, special day. I don't get to go on adventure with my partner as much as I'd like but our trip to Arran was just perfect: stunning scenery, the best company in the world, apples in the backpack and I even cast on something very special whilst there. Magic.